There is no doubt that the X Frame series from Tumi consists of some of the most expensive carry-on bags available. However, after taking a look at the products, I am convinced that the bags are surely worth their price. 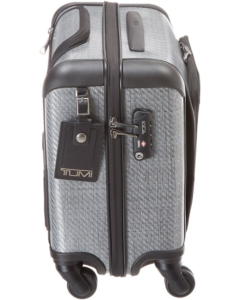 There are hardly a few brands out there that come close to Tumi in terms of quality of material and amount of features. 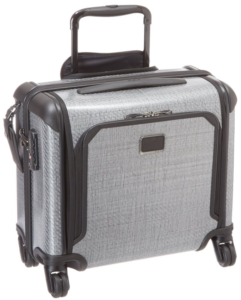 In the Tegra Lite X Frame series, Tumi has introduced two new international carry on products and one wheeled briefcase. The international carry-on luggage bags are immensely appealing, thanks to their sleek design and carefully thought design. Both the products have a different look, each as gorgeous as the other. One of the bag sports a minimalist design in dark grey shade, giving it a sophisticated look. The other has a more modern design, with attractive patterns in a light shade. What would you love about them? These high end bags surely have a classy aesthetic which is a true representative of their cost. Other than their look, the bags are similar to each other. 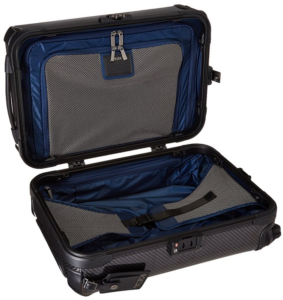 They have an ideal size which can easily carry your clothes and other necessities. I was more than satisfied with both the products’ wheel balance, so I’m sure they are not likely to trip even when you’re rushing to catch your flight. One of its unique features is that the bags are made of composite Tegris material. Not many of us really have an idea what that means. All you need to know is that the bags are sturdier than most out there in this price range. Also, the material makes sure that they are surprisingly light for bags that stand around 20 inch tall. Despite having below average arm strength, I was able to lift a fully filled X Frame bag with ease. Other than that, they have all the usual features you expect from a premium international carry-on like a three stage telescoping handle as well as external bumpers. The interior consists of tie down straps; a hanger bracket as well as three zipped pockets, all of which makes sure your things stay in place. One really cool feature which I haven’t seen in many other bags out there is its locking system. There was no zip ! The bags use a three point locking system. This is surely a huge advantage as far as your luggage’s security is concerned. Moreover, it saves you the hassle of zipping up a full bag. A lot of points go to Tumi for this feature. 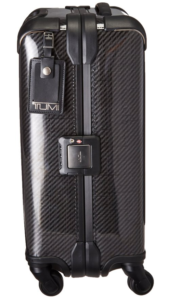 Even with their briefcase, Tumi has gone ahead with its trademark design policy of simplicity and sophistication. The briefcase does not sport any unnecessary patterns, giving it an elegant and professional look. The briefcase’s size is ideal, with a height of 16 inch and a width of around 16 inch. It is impressive how much the brand has been able to integrate in a briefcase as small as this. This compact briefcase has an accessory pouch, pockets to keep your phone or tab as well as removable laptop pockets and file divider. That is everything one needs while leaving for a quick business trip. 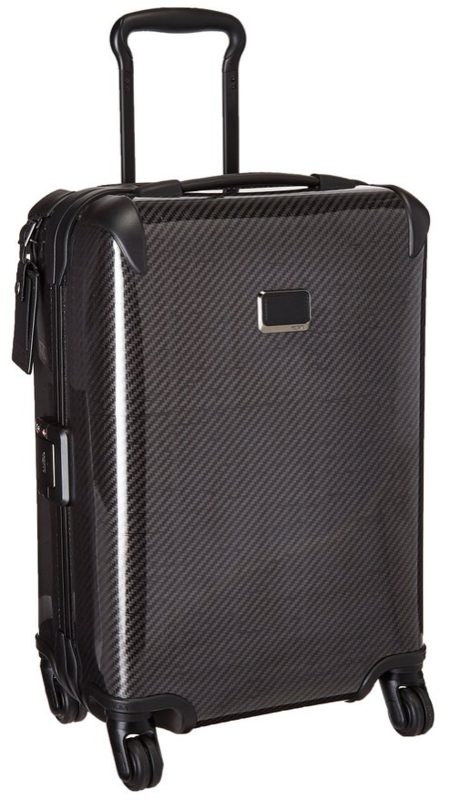 The briefcase has all the usual features like a top carry handle, dual spinner wheels as well as protective bumpers. But with Tumi, there’s always more. After reviewing their international carry-on bags, I was expecting to come across some unique features in the briefcase as well, and I was not disappointed. 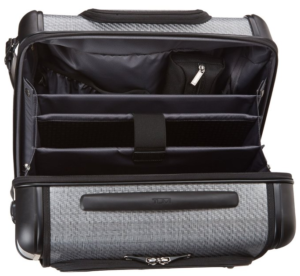 The X frame briefcase allows you to remove the organizational divider for a compact wheeled carry on piece that allows you to carry more than just your business necessities. Also, the bag sports an exterior pocket that gives you access to your interior gadgets and other things. This feature comes in especially handy when you’re waiting for your flight and can’t open the entire bag to take out the stuff you need. It is made of the same Tegris material used in most of the company’s products. That is the reason that despite being sturdy and thick, the product weighs only about 9 lbs. The briefcase is priced a little high, but considering the amount of features provided, I would surely recommend it. This entry was posted in Best Brands, Luggage For, Business Travel, Carry-On Luggage, Luggage For, Men, Luggage For, Travel, Luggage For, Women.